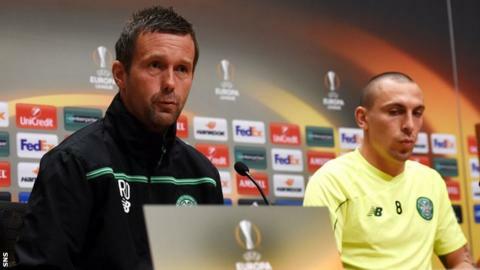 Celtic manager Ronny Deila says his team can "clear the air" if they pick up points away to Ajax in their Europa League opener in Amsterdam. Deila denied that Celtic are a club in turmoil, saying that "football never goes in a straight line up to heaven". The Norwegian is aiming to arrest a run of poor form which has seen them knocked out of the Champion League and trailing Aberdeen in the Premiership. "Good teams bounce back," said Deila. "It can be a circus, we know the demand is there. "We can win everything in Scotland. We are determined to win trophies and improve in Europe." Celtic are determined to improve on last season's Europa League performance and Deila wants a performance similar to the one in Milan last season when they performed well in the defeat by Inter. "Everything goes in circles," he said. "Last year we were unbelievable in set play. The players talk and practice. I've seen in training everyone wants to take responsibility. "We'll need to be compact and brave on the ball. "We know we can get back to that level of performance [against Inter]. "Small details will be the difference in this group. We want to get some points away. If you get through the group anything can happen. "It takes some time to get over it [the Champions League exit]; we can be disappointed but we have so much to look forward to. "We are much better prepared than last year, [we] know each other better and played a lot of matches together." Deila admits the European situations faced by his team and their Dutch opponents is a similar one with Ajax also knocked out of the Champions League qualifiers. "Both clubs are so huge, the situation is quite similar," he said. "We both get talented players, develop them and have to move them on to bigger leagues. "But I'm lucky - I'm at the biggest club in Scotland and have best players in Scotland. It's about getting this team performing and we have done it so many times and won trophies. "It's going to be a long season and we want to try to get a result here." Celtic captain Scott Brown admits the players have "let themselves down" in recent weeks, with defeats by Malmo and Aberdeen. "We know we can play better and believe in ourselves more," said Brown. "We know we're a lot better than we've shown." Regarding his performances for club and country, Brown said: "Everyone has ups and downs and I'll come back stronger and fitter. "We need a bit of luck as well. It's about small little details. We don't turn up and hope it happens. It's about confidence. "We've let ourselves down recently. I don't like getting beat, we need to show that we deserve to win these games."